Kinect Groups range of Battery Operated devices are all IP-67 rated and allow tracking in either real time or daily updates. Check out our pricing page to see the options for these devices. The KY-4 measures just 85 x 63 x 24 mm. Enclosed in the housing is the GPS and Cellular antennas plus the 3 x AAA battery holder. · Pallets, bikes, livestock and parcels. The KY-4’s 4G modem is compatible with both Cat-M1 and Nb-IoT networks - enabling great new benefits. Traditional cellular network specifications (like 4G LTE Cat 9/12) are designed to provide high speeds and bandwith - to enable smartphone users to stream videos and facilitate other data-intensive activities. The LTE Cat-M1 and NB1 specifications allow the cellular modem (uBlox SARA R4) to be simpler and smaller, and in turn allows the KY-4 to still have excellent battery life (up to 3 years) on just 3 AAA batteries! The KBOO-4 is a compact, rugged GPS tracking device that has been designed for tracking containers, trailers, skip bins, and other assets where super-long battery life is required without sacrificing the frequency of updates and performance. The IP67 rated housing is rugged and UV stable, so the KBOO-4 can be mounted on assets that are exposed to rain, dust and marine conditions. By utilising the latest technology, the KO-4 can operate in ultra-low power modes, and with an incredible battery life of up to 4 years the KO-4 can be attached to assets and tracked without needing to change batteries. The KO-4 has built-in antennas for GPS reception and for cellular communication, a 3D accelerometer, a high-performance GPS that can track both GPS and GLONASS satellites simultaneously and flash memory for storing non-volatile information. The Lithium batteries have excellent performance and capacity, and allow the KO-4 to be used in extreme temperatures and climatic conditions that other tracking devices simply cannot operate in. The KBOR-4 is a low-profile, rugged 4G GPS device designed for tracking non-powered assets where super-long battery life is required without sacrificing the frequency of updates and accuracy performance. The KBOR-4 is able to roam onto cellular networks across the globe giving you global coverage of your assets movements at a low SIM card data cost. Communications with the device are two-way, allowing the KBOR-4 behaviour and update rates to be changed Over-The-Air (OTA) including being able to be switched into “Recovery Mode”. By utilising the latest technology, the KBOR-4 is able to operate in ultra-low power modes. With an incredible battery life of up to 5 years the KBOR-4 can be attached to assets and tracked without needing to change batteries. The option of using extended temperature range batteries allows the KBOR-4 to be used in extreme climates that other tracking devices simply cannot operate in. Optional magnetic tamper detection allows you to be notified should the device be removed from the asset, giving you peace of mind that your assets are protected. 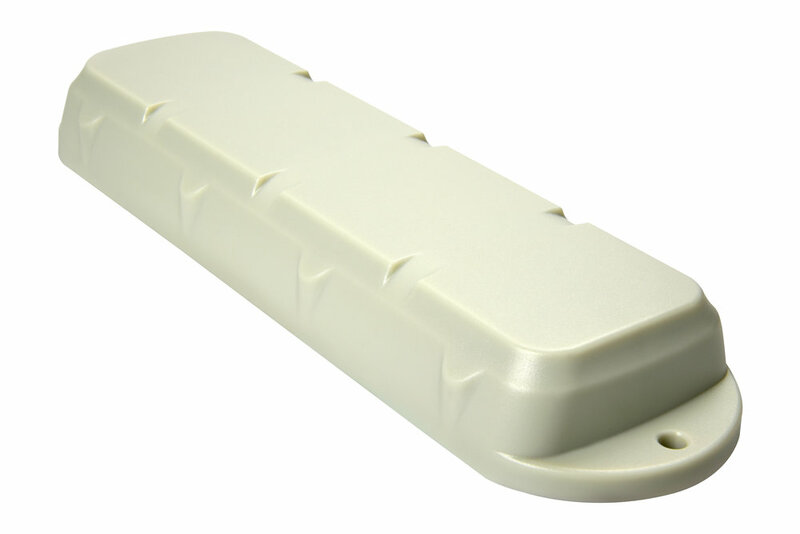 Convenient mounting holes and strap slots make it easy to mount the Remora in the corrugation for containers tracking, or conceal on the underside of a trailer. No install required, simply "place 'n trace"
SmartOne C runs for up to 500 days on a single set of batteries and supports location tracking and two independent alarm inputs. SmartOne C provides a low cost solution for tracking your remote assets.